Lynda Resnick is an American entrepreneur and billionaire with her husband and business partner Stewart Resnick. Lynda Resnick's parent company The Wonderful Company owns POM Wonderful, Fiji Water, Teleflora and other successful brands. Lynda Resnick is an inspirational figure for women in business and aspiring entrepreneurs all across the world. She is also a great source of quality quotes for entrepreneurial inspiration. 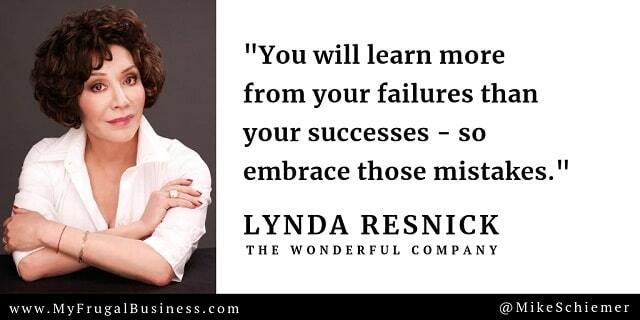 Here are some of my favorite motivational business quotes from Lynda Resnick of The Wonderful Company. 1. "If you have a business website; make it stickier." 2. "When you wake up each morning, you can choose to be happy or choose to be sad." 3. "The most important audience drivers on the internet are paid search and keyword optimization." 4. "The thinner a newspaper or magazine is - due to reduced revenue from advertising dollars - the less editorial content because of the standard ad-to-editorial ratio, and the less money there is to support investigative journalism." 5. "Redo the merchandising often and try new things." 6. "Most Fortune 500 companies began as small start-ups whose entrepreneurial founders slowly developed the infrastructure, hired the staff, sourced manufacturers or built their own factory, and created distribution, sales, and marketing plans." 7. "Hit the right homepage... then try and beat that." 8. "Some of the most innocuous inventions have proven earth-shattering, with reverberations felt around the planet." 9. "Since the advent of the Internet - more recently compounded by blogging - everyone can be a published voice." 10. "When the sun shines through your window, choose to make it a happy day." 11. "You will learn more from your failures than your successes - so embrace those mistakes." 12. "The Internet is the poster child for disruptive technology, but even such inventions as Amazon's Kindle and Apple's iPod have rocked their respective industries by changing how we entertain ourselves." 13. "When a project is successful, you're never really sure why, because so many elements come into play. However, when you fail, you always know why. That is how you learn and grow." Thank you for all of the quality quotes from Lynda Resnick! I hope you enjoyed this blog post about top motivational business quotes from billionaire and boss Lynda Resnick.